In the midst of making costumes, I realized I never shared any of my previous homemade costumes. One of the ones I am most proud—is of my favorite Disney character, Pocahontas. 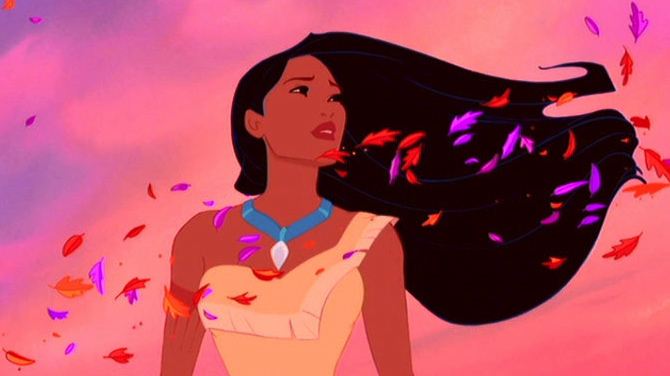 I remember growing up and seriously believing that I was Pocahontas. I always felt as though I could relate to her so much. And who could not love the song, “Colors of the Wind.” I would sing on the top of my lungs (as if I really was a great singer!) LOL. Last year, I decided to try and replicate as much as I could of Pocahontas. It was actually pretty easy compared to my previous homemade costumes. The only thing that was really time consuming, was making the necklace. The finished piece—I had to accessorize with some arm candy, and of course shoes! Couldn’t walk around barefoot like Pocahontas! 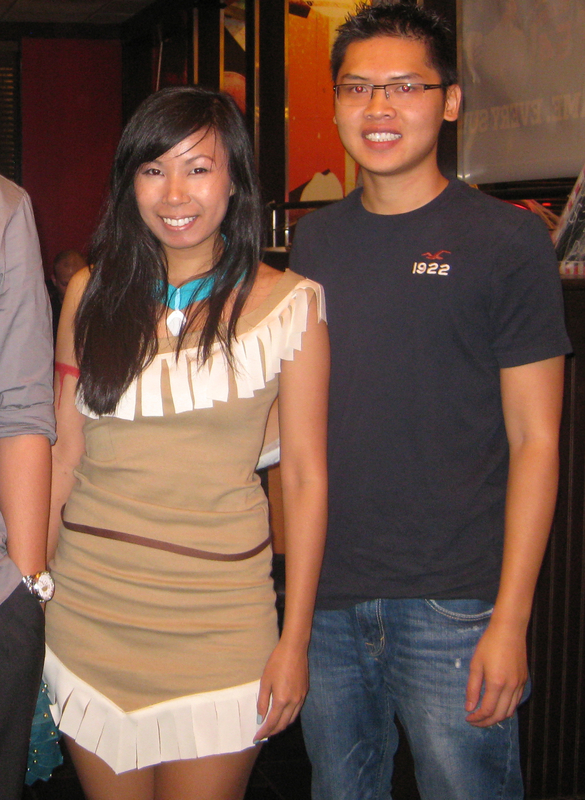 With my boyfriend…He really did not want to be my John Smith. 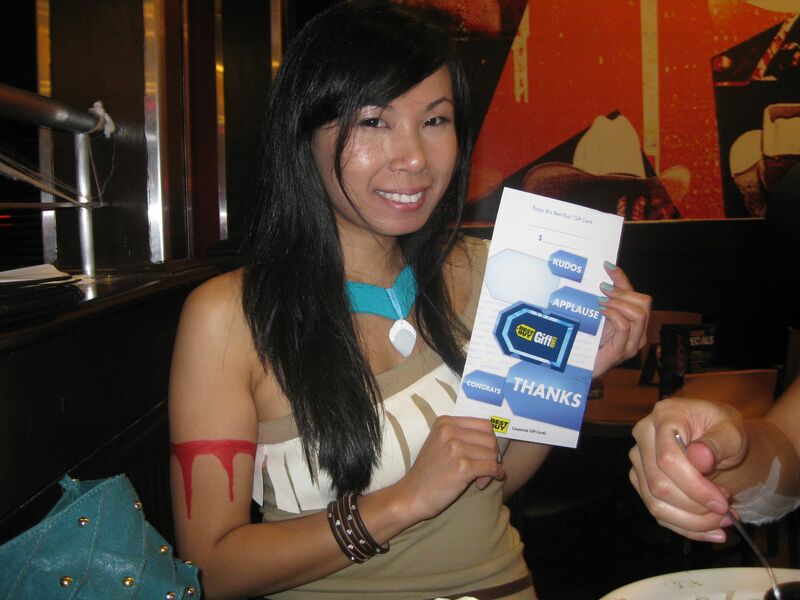 We went out to dinner before meeting up with everyone else, and there was a costume contest… Proud to say, I WON! Ending the night here with my sister and this guy’s hilarious homemade costume! Sometimes I like going out just to see what others’ are going to dress as. I even saw someone dressed as a Tampax tampon box….don’t know why anyone would want to be that for Halloween—but, to each his own! What are some crazy costumes you have seen? Wow! 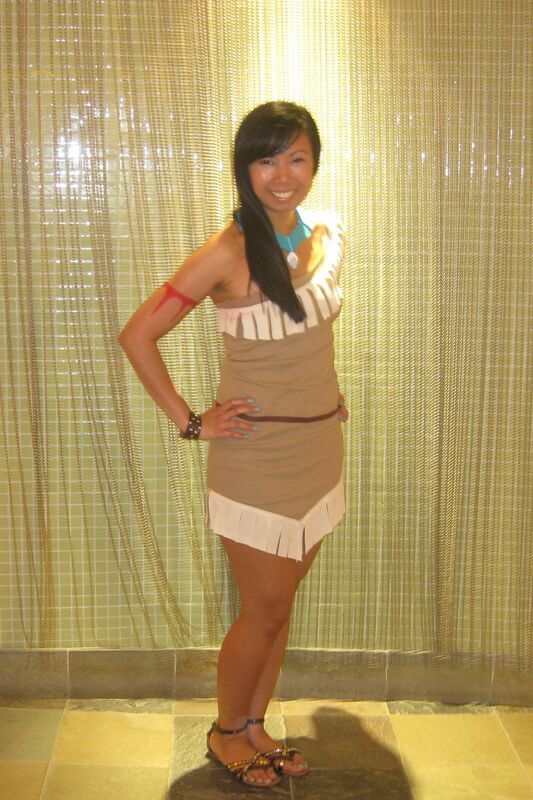 Your Pocahontas costume is amazing!! Besides, if I may say so, you look really great in it 🙂 I wish I was gifted in that area, too. It would be great to go as Disney Princess for Halloween or carneval. Sadly, the costumes resembling the Disney princesses, that you can buy, aren’t really pretty. At least not those I have seen so far. I definitely agree, the Disney costumes that are available to buy, are not that great. But I wouldn’t attempt to make a costume for Cinderella, Snow White, etc… I wouldn’t know where to start in making a gown! Pocahontas was as simple as it could it for me. When looking for inspiration to make the costume, I found this website that I think you may like— http://meazara.webs.com/, these girls have done an amazing job on their Disney Princesses costumes! Could you please share how you made the costume? What type of fabric did you use? You did an amazing job!! Hey Jen! Thanks =) I wish I had step by step pictures to share or even an idea of what type of fabric it is, but I honestly just started to cut and sew, LOL. I’ll try to explain and hope it makes sense. I’m not sure what the fabric name is, but I found it at Joann’s. It’s a thicker fabric with a similar texture and stretch as a “wife beater” men’s undershirt. Honestly, it was the only material with stretch and in a cappuccino color so that’s why I picked it. Overall, the material is easy to work with and fits perfectly and has that stretch if necessary. I took a one-shoulder dress that I had and used that as my stencil for the dress. I traced the dress and just extended it a bit to make a triangle end. I cut two pieces and sewed the sides and one shoulder to get the dress. For the cream colored adornment, I just took a 2.5″ in height long rectangular piece and sewed it onto the ends to follow the triangle end of the dress and on the top of the dress. When that was attached, I just cut the fabric to give the ruffled ends. The belt was a brown type of shoe lace ribbon I also found at Joanns and I placed that on like a belt and secured with a safety pin.